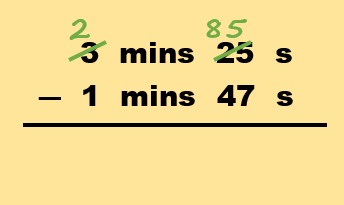 Subtracting Times is almost the same as subtracting decimal numbers but when we borrow from the next column, we don’t add a 1, but we add 60. This can prove problematic for many pupils who will auto-pilot into adding a 1. Consider the example below before trying our FREE transfer test worksheet on subtracting times. 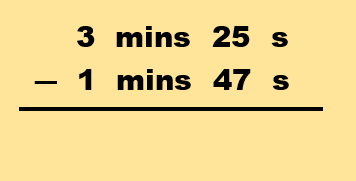 Here, we must borrow from the minutes column because we cannot subtract 47 from 25. 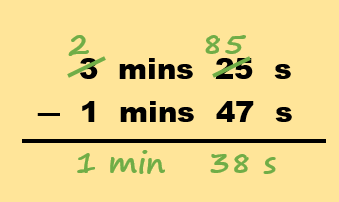 Notice that when we reduce the minutes from 3 to 2, we add 60 seconds to the 25 seconds already there to get 85 in the seconds column, and not 125 seconds! Take care not to make this common mistake. Now that we have borrowed, we can subtract 47 from 85 and 1 from 2 to arrive at our answer. 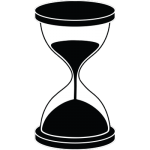 And that’s it – borrowing from hours to minutes is, thankfully, exactly the same. Find this useful? Why not take the time to tell your Facebook Friends?